While this kind of story feels a bit familiar, its excellent music & sense of realism along with the fine performances make up for it. Ranveer Singh and Alia Bhatt in Gully Boy. Cast: Ranveer Singh, Alia Bhatt, Kalki Koechlin, Vijay Raaz, Amruta Subhash, Vijay Varma, Sheeba Chaddha and Siddhant Chaturvedi. “There will be obstacles. There will be doubters. There will be mistakes. But with hard work, there are no limits.” Zoya Akhtar's Gully Boy is a film that’s based on this simple but intimate premise. It is really impressive the way that Gully Boy catches your attention. The film is loosely based on the remarkable story of Mumbai's street rappers Divine and Naezy. The way Ranveer Singh plays his character is really impressive and it's one major factor that makes you enjoy this film more. The film chronicles the life of Murad (Singh) who lives with his family in the densely populated Mumbai slums. Deep inside, Murad aspires to break free from the chains of the reality of his life through poetry and passion and rawness of rap; the one place he gains a feeling of purpose. Murad is in a relationship with Safeena (Alia Bhatt) who is a sharp medical student and a possessive girlfriend of his. The couple shares a relationship hidden from their parents. Amidst this blooming secret romance, Murad meets amateur rapper MC Sher (Siddhant Chaturvedi), who encourages him to perform his own lyrics. The duo records a rap video that goes viral. A wannabe music producer Sky (Kalki Koechlin) sees the video and offers to fund their music. Seeing Murad's increasing closeness with Sky, Safeena gets mad jealous of her, which leads to their break up. When Murad's mother (Amruta Subhash) gets subjected to domestic violence, he decides enough is enough and leaves his father's home to protect his mother's self-respect. In the desperate need of money, Murad joins his friend (Vijay Varma) in petty criminal activities. Will Murad rise above the oppression and make a name for himself? After helming some excellent films like Luck By Chance, Zindagi Na Milegi Dobara and Dil Dhadakne Do, director Zoya Akhtar has already proved her expertise in well-observed character study. Akhtar and co-writer Reema Kagti work together for a solid foundation to design a more character-driven story. However, the film follows tried-and-tested 'triumph against odds' template which results into a predictable underdog story. The rap music is not really the entire plot of the story, but it is more of a sub-plot used to show the life of a young man trying to deal with the problems of life. 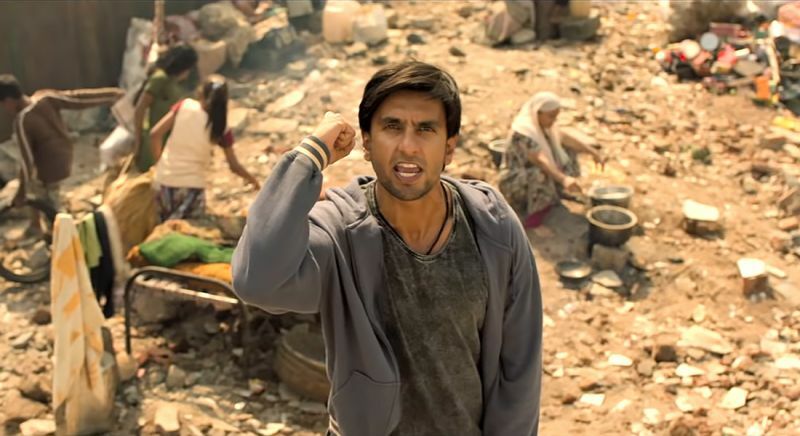 But even in that case, Gully Boy falls a few steps short of greatness in terms of really delivering an emotional punch. Although the central character and the situations and people he becomes involved with are engaging, there's no actual plot to follow and this ends up becoming quite a distracting hindrance. The film has a slightly heavy inclination to rely on formula. You know how it’s going to turn out, not just in the end, but also stuff that leads up to the end. And the film doesn't even try to prove you wrong. The ending is predictable but still you wait there hoping that just maybe the film will surprise you along the way. Alas, it never does. There’s the usual final round at contest sequence, things at stake urgency, and a sudden change of heart. These tropes of commercial films make the narrative a little too convenient. While this kind of story does feel a bit familiar overall, its excellent music and sense of realism along with the fine performances make up for it. The film gives us a fascinating glimpse into a subculture that many of us have formerly viewed only from the outside. Especially intriguing are the 'hip-hop battles', wherein rappers come on stage and challenge one another to perform spontaneous mutual put-downs, with the audience getting to determine the contest's winner. No matter what one may feel about rap music itself, one has to admire the talent involved in composing these rhyming verses extemporaneously. Akhtar is terrific at getting up close in macho environments and bringing us right into their verbal violence. Another thing that the film does well is its use of subtle yet specific commentary on class system, social injustice and gender play in the society. Also worth noting here is the outstanding cinematography of Jay Oza which widely lends itself towards upping the ante of the picture and making you feel the authenticity of a world. The film is shot in a way that brings out the intimacy of the moments, while not losing the big picture. Ranveer is quite terrific with both his simmering intensity and bursting energy. Shedding his image of badass macho alpha hero, Ranveer is utterly believable as just another regular guy. Alia Bhatt adds wonderfully to the film as Ranveer's romantic interest, perfectly capturing the mercurial nature that you would expect from the kind of person that her character is. Together they create an electrifying chemistry on-screen. Debutant Siddhant Chaturvedi has a true screen presence and leaves an impression of a remarkable talent. Kalki Koechlin is immediately likeable and she is energetic enough to keep the film's tempo from flagging. Vijay Varma is terrific. Vijay Raaz plays the villain father, the guy you hate but the performance that makes the rest of the film that much more effective. His scenes with Ranveer, especially towards the end, are some of the standout moments in the film. At the end, Gully Boy is not perfect, but definitely it's own thing with some good moments. And when they're good, they're really good.